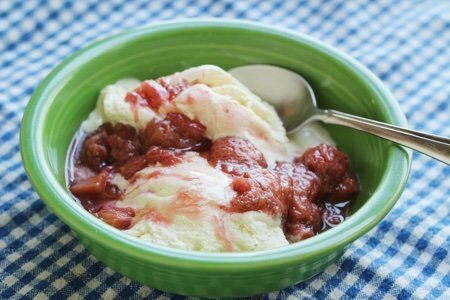 This strawberry rhubarb compote in a slow cooker recipe will change your mind about rhubarb. I know there are people out there who think rhubarb is from outer space. I mean LOOK at it. Who would have thought to eat that weird looking stalk? But, you should try it. This doesn’t take any fancy ingredients or a lot of preparation time. I cooked this for 2 hours in my slow cooker. Other easy recipes include my light rhubarb crisp and my healthy rhubarb muffin with walnuts but THIS compote is perhaps the easiest. 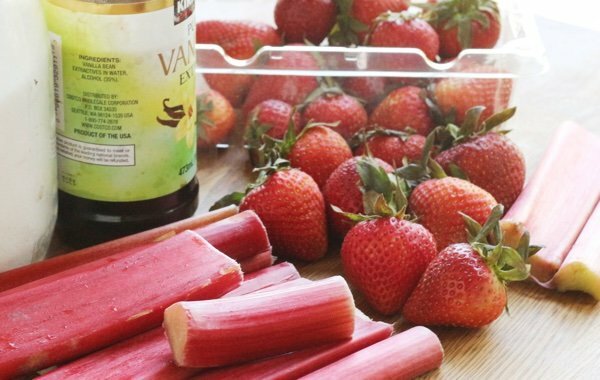 When you mix rhubarb with strawberries you get this wonderful sweet and sour flavor that you can’t find anywhere else. I have included a video (my first of this type) to motivate and inspire you to give this a try. I think it will be fun to include more of these short videos in order to show all of you how easy this really is!. Please watch it what you think of it! 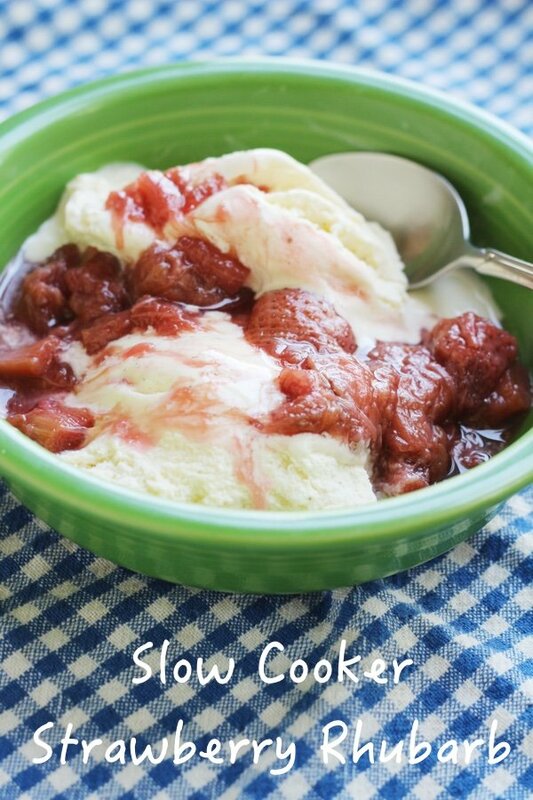 You had me at strawberry rhubarb! I love this flavor combination and am super impressed with how easy this is. thanks! By the way - love the video - you did a great job! Looking forward to more of them. Do you think you could freeze this and have strawberries and rhubarb all year long? I LOVE rhubarb. @Kathleen - This will freeze REALLY well. Great idea!!! Ah, rhubarb, the tart taste of Spring! For those with some sunlight on a patch of lawn, it's very easy to grow from transplants if you've prepared the soil with compost, and then years and years of spring harvesting with hardly any effort. My plot is about 3 x 5 feet. My family enjoys a rhubarb strawberry crumble. I don't have any exact amounts; for a 9 x 13 pan, place sliced rhubarb, strawberries, sugar (brown is ok, too), and about two tablespoons instant tapioca. Mix and let stand 20 minutes. Top with a heavy layer of old fashioned oats (about 4-5 cups, brown sugar, some flour mixed with a stick melted butter. Bake 1 hour at 400. Enjoy warm or cold. I especially like it from the fridge. Never had rhubarb but going to try this. Thanks. Strawberry Rhubarb anything is one of my favorite summer flavors! This looks delicious and I love how easy it is!! This brings back memories from rhubarb growing in our yard and just picking some off the top and munching on it right out of the ground. Sour but YUMMY. Nice job on the video. Looks yummy. Really enjoy reading your posts! But I am totally computer challenged and for for the life of me cannot figure out what to click on to see your first video. Please help! I love your video - and the recipe, of course. What could be easier!?! The format is great, simple and to the point. It emphasizes the ease of making this delicious recipe. I'm hoping you'll do many, many more. It's one thing to read the recipe; another to see it and just how easy it is to "throw" it together. I love your site and this makes it even better - HOW is that possible!?!? Make more videos, please. Great video, Lisa! You have convinced me to try this recipe! I have never tasted rhubarb....but I want to now! I am so disappointed that I couldn't get the video to play. the recipe sounds great. I can,t wait to try it. I made this twice in the paste week. It is delicious! I've always loved this flavour combination! My local pastry shop has just this last couple of weeks started featuring individual tarts with a crumble topping and your recipe has come just in time to save me from myself!! Strawberries and rhubarb both on sale so I'm off to stock up, cook and indulge. So many thanks for your timely intervention! P.s. Sorry Lisa - forgot to mention how much I enjoyed your video. A merry tune which had my feet tapping and my mouth watering! Keep the rhubarb recipes coming! I grow a plant at every house I've moved to. My family doesn't like it but it brings back so many memories of my childhood on a little farm in Michigan. I love it. 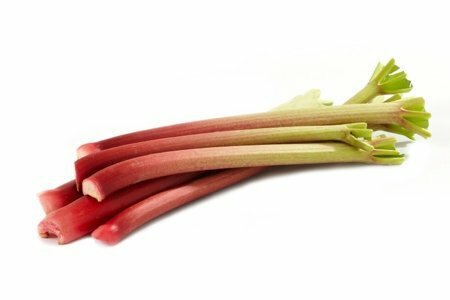 I too am from Michigan and my mom grew rhubarb in our yard also. I have loved it since a child. I rarely make it as I am the only one who loves it and I can make a batch (minus the strawberries) and eat the whole thing -- can't be doing that! I love the idea of freezing some of it. Question -- could you substitute Stevia for the sugar?? Thanks for all your great ideas and recipes! Hi Candance - I've just finished making this recipe with stevia. I doubled the recipe to have some to freeze and used 12 individual packets of stevia - 0.035 oz or 1 gram each. I like it a bit more tart than sweet. Hope that helps. Candace-I lived in the middle of the thumb, Michigander's will get this, and now live in Colorado. I have not used stevia but I'm going to try it. I like Truvia, some stevia products I don't like the taste. Jane-thanks for letting us know the amount you used. I like rhubarb tart too. Maybe a small amount of sugar mixed with stevia would be good. I also love a strawberry rhubarb combination. We use it on top of oatmeal, yummy.